First year Bachelor of Agricultural Sciences student Jana Dixon is the proud recipient of three prestigious scholarships to support young people who are passionate about agriculture. In the past few months she has been awarded the Lois Harris Scholarship by the Agricultural Bureau of SA, the Playford Trust Regional Science and Engineering Scholarship, and an RIRDC Horizon Scholarship supported by GRDC. On completion of Year 12 at Clare High School, Jana received an outstanding ATAR result of 99.15. She said the scholarships have greatly assisted her transition from the family farm to University life, both in an economic sense and by providing professional development and mentoring opportunities. Jana’s keen interest in a career in Agriculture began on the family farm in the Clare Valley. “It is mostly cereal cropping with some sheep over summer,” she said. A strong connection to the farm meant a career in agriculture was a likely path. In 2013, Jana was one of 100 students selected from around Australia to attend the University of New England’s (UNE) Generation2050: Project Feed the World conference in Armidale, NSW. Generation2050 involved local farm visits and practical activities at UNE related to agronomy, animal science and agribusiness. This event led to Jana being selected to spend a week with an agronomist at UNE at the end of 2014, visiting local properties and advising farmers about pastures and livestock. 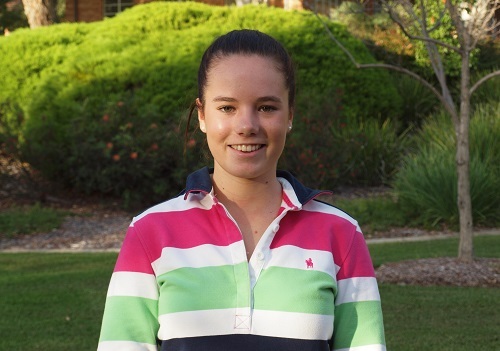 When considering university, Jana sought the advice of a local agronomist back home about the relative benefits of studying at the University of Adelaide or UNE. She decided to stay in South Australia so she could learn more about the agricultural systems here and be closer to home. Jana has strong connections in Clare and goes home every weekend to play netball and help on the family farm. “Going home is always good, even though Dad saves up all the worst farm jobs for me,” she said. She said there are a lot of familiar faces from high school studying at Waite and she is also on the Adelaide University Agriculture Students Association (AUASA) Committee as one of two first year representatives. “It has been fun to interact with students in the other year levels through the AUASA and the social events are really good,” she said. “You want to have friends and connections as well as a degree when you finish university and being involved with the Association will help that”. Lois Harris Scholarship: awarded by the Agricultural Bureau of SA to a 1st year BAgSci student at the University of Adelaide in recognition of academic excellence. Playford Trust Regional Science and Engineering Scholarship: awarded to outstanding students from regional and rural South Australia entering a 1st year STEM degree at one of the three South Australian universities. Horizon Scholarship: an initiative of the RIRDC that, in partnership with industry sponsors, supports undergraduates studying agriculture at university. Provides a bursary as well as professional development and mentoring opportunities including industry work placement and networking events. Jana’s scholarship is sponsored by GRDC.